Fullwood points out the enormous gift for researchers and scholars have with access to the unusual depth and range of materials in the Lorraine Hansberry Papers, as generated by the executors of the Lorraine Hansberry Estate over the last 50 years. “For many, A Raisin in the Sun is their first encounter with Hansberry. Few know about her other writings—plays, articles, short stories, poems, editorials—not to mention her work as a political activist. Even fewer know about her work as an associate editor for Freedom newspaper in the 1950s or that she had relationships with women. 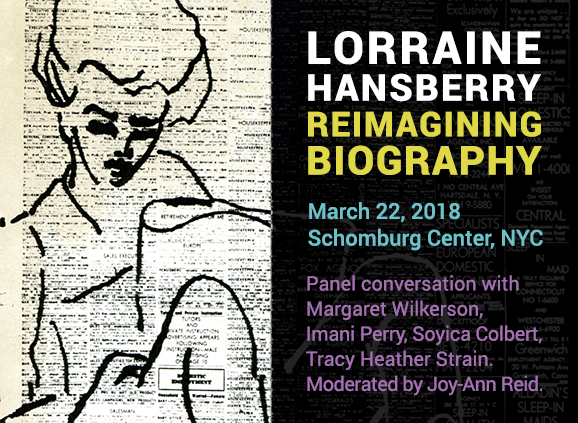 Lorraine Hansberry: Reimagining Biography panel will be introduced by Joi Gresham, the executive director of the Lorraine Hansberry Literary Trust, and moderated by Joy-Ann Reid (national correspondent, MSNBC). Panelists include Margaret Wilkerson (author of forthcoming Lorraine Hansberry: Am I a Revolutionary? and Professor Emerita of African Diaspora Studies and Theater, Dance, and Performance Studies at the University of California, Berkeley); Imani Perry (author of the forthcoming Looking for Lorraine: The Radiant and Radical Life of Lorraine Hansberry and a professor of African American Studies at Princeton University); Soyica Colbert (author of the forthcoming Lorraine Hansberry: Artist/Activist and professor of African American Studies and Theater & Performance Studies at Georgetown University); and Tracy Heather Strain, (director of Lorraine Hansberry: Sighted Eyes | Feeling Heart, PBS national broadcast January 2018).